Migraines are bouts of intense recurring and painful headaches. Before the actual attack of migraine the person can feel warning signs and other symptoms. Unfortunately, the patient has to suffer from the extreme pain of migraine for hours or even days if timely medical treatment is not sought. 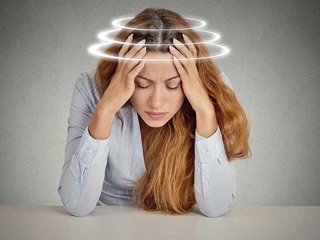 People affected with migraine are likely to have an aura of sensory disturbances followed by severe headache that commonly appears on one side of the head. The exact cause of migraine is not known to the medical world till now. It is believed that it stems from the abnormal activity of the brain. If someone in your family is suffering from this condition, it increases your chances of getting affected; genetics certainly has an influence on this disease. However, the following factors are likely to trigger migraines. Physical causes: Fatigue and not having enough sleep, shoulder or neck stiffness, poor posture and overexertion have all been related to migraine. Hypoglycemia (low blood sugar) and weariness can also act as triggers. Dietary triggers: Alcohol and caffeine can set off migraine attacks. Some specific foods are also attributed to cause migraine. For e.g. chocolate, cheese, citrus fruits etc. Irrational eating habits and dehydration have also been labelled as potential triggers. Medications: Some sleeping pills, hormone replacement therapy (HRT) medications and contraceptive pill can kick off migraine attacks. Environmental triggers: Flickering screens, pungent smells, passive smoke (second-hand smoke), loud noises can act as triggers. Cramped rooms, temperature changes, bright lights can also be the causes of migraine. •	Though symptoms of migraine differ from person to person some people can pinpoint the triggers or factors that lead to migraine headaches, such as tension, stress, allergic reaction etc. One should understand the difference between migraine and headache to seek correct treatment. Headache may vary in their effect as to how severe, how long and why they happen. Unlike migraines, there may not be a recognisable pattern. Migraine attacks present as moderate to severe headache and generally appear on one side of the head, usually accompanied by vomiting and nausea. In some people special diets such as gluten-free is also found beneficial. One should seek a medical opinion if the above-mentioned lifestyle changes do not bring a visible difference in the frequency of migraine. If lifestyle changes fail to curb migraines, the next line of treatment is taking a course of medications. There are many different types of migraine medications, including painkillers. Some medicines might suit some types of migraine but in some other people the medications used to treat migraine can be counter-productive as it can lead to medication overuse headache (MOH) or rebound headache. This happens after taking too many medications in an attempt to prevent bouts of migraine. So due care should be taken and medicines should be taken only on the prescription of a doctor. Have questions on migraine? Drop a message at www.plexusnc.com and we will get back to you as soon as possible. Next PostNext On Our 7th Anniversary..